Self-similar behavior for all narrow [Fe/H] populations: a decline always found at the high-[Mg/Fe] end. Looking at the dotted red lines in the 3 panels above, we can see that the velocity dispersion decline comes from older stars which were born in the inner disk. The lower the velocity dispersion, the older the stars and the further inside the disk they come from. The peak in each velocity dispersion curve comes from the perturbations on the disk from infalling satellites (mergers), which heat the outer disk easily, while at the same time induce spiral arms and thus radial migration from the inner disk. 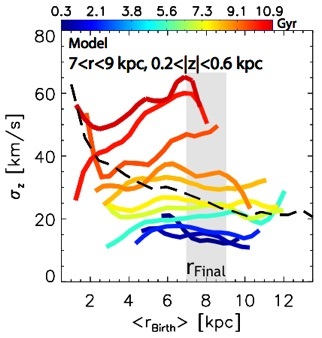 Because kinematically colder stellar populations migrate more readily, the stars which arrive at the solar neighborhood are colder than the local ones. 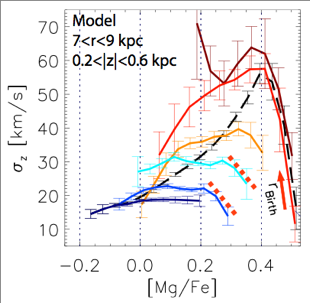 This causes the decline at the high-[Mg/Fe] end of each metallicity subpopulation. 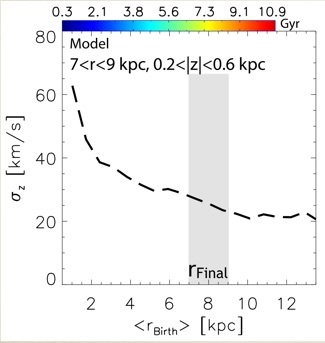 2. the amount of radial migration induced by satellites (directly by their tidal pull and indirectly by strengthening the disk asymmetries) at a given cosmic time from the decline in velocity dispersion and the fraction of stars in the high-[Mg/Fe] end. 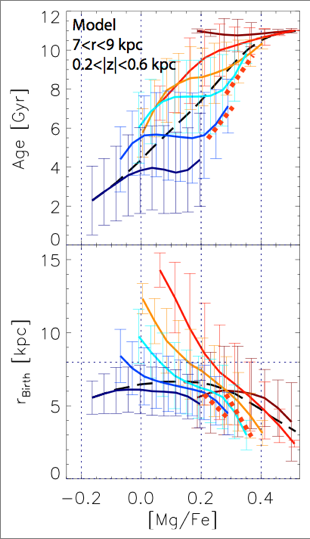 Age (top panel) and birth radius (bottom panel) as functions of [Mg/Fe] for stars in the same simulated solar neighborhood sample, which matches the RAVE data. Black dashed curves show the total population. 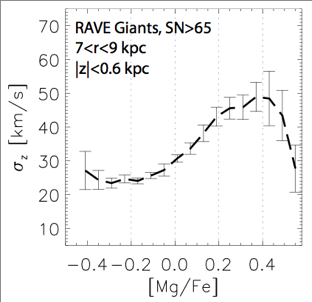 The above relation was also found in SEGUE G-dwarf stars (Minchev et al. 2013), in data from the Gaia-ESO survey (Guiglion et al. 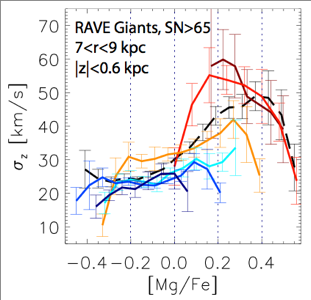 2015), as well as in APOGEE giants (Minchev et al., in preparation). Vertical velocity dispersion of stars currently in the simulated solar neighborhood (grey vertical strip centered on 8 kpc) plotted against stellar birth radius. Naively, it can be inferred from this plot that stars born in the inner disk constitute the hottest population at the solar radius today.